After seeing so many headlines about the tragedy that the people of Puerto Rico are facing today due to the effects of Hurricane Maria, we felt like something had to be done. Surely, most of us want to help in whatever way we can. In most cases, going to PR and lending a hand is very difficult for the average person as well as donating money. So we thought up of a way to raise money (and continuously!) to help these people in need with the advent of a digital currency known as Monero. And the best part is that you don't even have to spend a single cent. 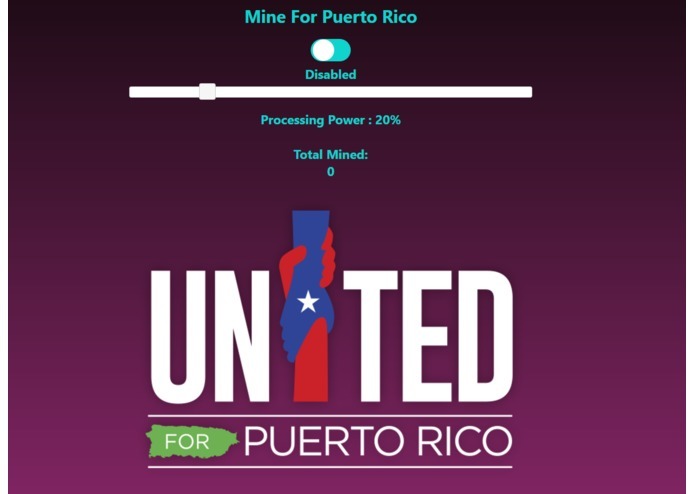 Mine for Puerto Rico allows anyone who goes onto our website to dedicate a portion (anywhere from 0-100%) of their CPU processing power to mine for digital currency, allowing the user to use their computers at ease while they raise money for helping out this very urgent humanitarian crisis. The money will be stored into a digital wallet and so the more users we get to go onto the site, the more amount of money that gets generated! So to really make an impact (and we cannot stress this enough) this would have to be a COLLECTIVE EFFORT. All the proceeds will go to United for Puerto Rico, an initiative brought forth by the First Lady of Puerto Rico, Beatriz Rosselló in collaboration with the private sector, with the purpose of providing aid and support to those affected in Puerto Rico by the passage of Hurricane Irma and Hurricane María. Our original plan was to have a chrome extension plug-in run constantly in the background to mine since it would be more practical than having the user go to a website when a simple plugin would do the job just fine. Our issue lied within keeping the process running in the back as soon as the user exited the plugin. Luckily the website allowed us to work around this issue but we will definitely plan to make this tool plugin friendly! We managed to find a way to help people using technology as a medium. Making chrome extensions are surprisingly easy! Originally, we had planned to make this miner collect for charities of all sorts, allowing the user to select from a variety or organizations to donate. We plan to make this a functionality in the future! I worked on the UI/UX design for the website.